W is for weird, wonderful, wild and Weaves — the Toronto band who have just released their first LP, the succinctly titled Weaves, with Buzz Records. The 11-song debut came together through spurts of sporadically scheduled sessions over a two-year period at different studios in Toronto: Junction Triangle's Candle Recording with Leon Taheny, Union Sound in Corktown and at Noble Street in Parkdale. The album is a without a doubt a proper capture of the high-energy and rather inexplicable sound the four-piece create — a sound that evades genre labelling but is undeniably sticky pop music that hits a little harder and weirder than most. The journey to Weaves' debut has gone from demos that singer Jasmyn Burke would send to guitarist Morgan Waters to full-group efforts, a transition that hasn't always gone smoothly. While some songs on Weaves are two years old, others, like the highly improvised "Two Oceans," were the product of chaos. "Recording 'Two Oceans,' I was having a minor freakout," bassist Zach Bines tells Exclaim! "I was like, 'What the hell are we doing?' You vacillate between really being in the moment of something that none of us really know where it's going, but then your logical mind will clue in and be like, 'Why are we doing this when we could be doing something that we're 100 percent confident about?' We're in the studio. We're paying for the time. It's just hard to know at what times to focus in like that, and at other times to just let it all go." Burke adds, "It doesn't feel human all the time, you know. You want to feel the feelings you had when you first wrote it. Sometimes when you have something fresh like that… I don't know if we'll be able to capture 'Two Oceans' live again.... If you hear the extended version — if we release that one day — you can hear us just yelling at each other during the song." Despite how naturally and effectively the band can communicate with each other — like true pals, they endlessly and amusingly riff off each other — they admit that when it comes to using words to express how they feel, it doesn't always pan out. "We're good at working together, just [Burke and I], but maybe with a group it's more difficult because we're both trying to deal with the dynamic," Waters explains. "I'm kind of controlling, and she has her own vibe, too. I think we can work it out together, one on one, but with the group, everything's going nuts and we're trying to bring it back in in our own ways. We can only communicate or listen to each other when we're playing music — the rest of the time the communication is such garbage. Verbally we're lost." Speaking of the band's dynamic, Burke adds, "It's like finding a balance with everybody because we're all kind of in our own zone. But then when we get on stage together, all that bickering, it's all to help with the live show. We're not so good at listening in life, but that helps in music." 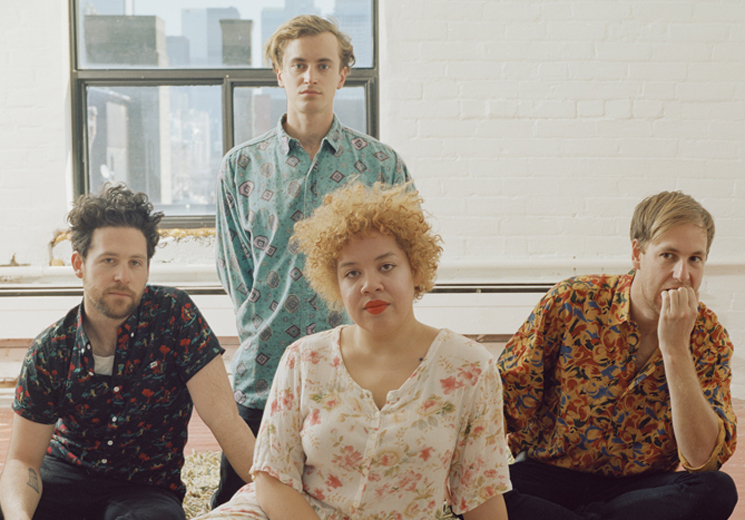 Weaves have a long string of tour dates coming up in support of the album. You can see all those over here. You can also watch their newly shared video to "Tick" below, as well as that for "One More."